PORT-OF-SPAIN, Trinidad - Presidents Barack Obama and Hugo Chavez have met for the first time, shaking hands as the Summit of the Americas gets under way in Trinidad and Tobago. 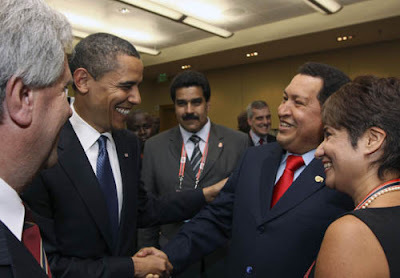 Photos released by the Venezuelan government show the two smiling and Obama touching Chavez on the shoulder. The Venezuelan presidency says Obama initiated the handshake. It quotes Chavez as telling Obama he hopes for better relations between their nations. Chavez also reportedly said Friday: "With this same hand I greeted Bush eight years ago. I want to be your friend." As recently as last week, Chavez expressed a desire to "reset" relations with Washington.